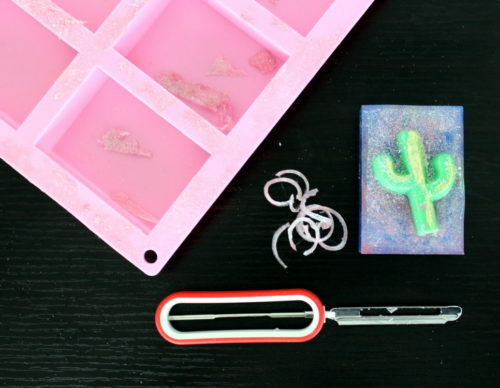 Learn how to make your own colorful DIY cactus soap using melt and pour soap! 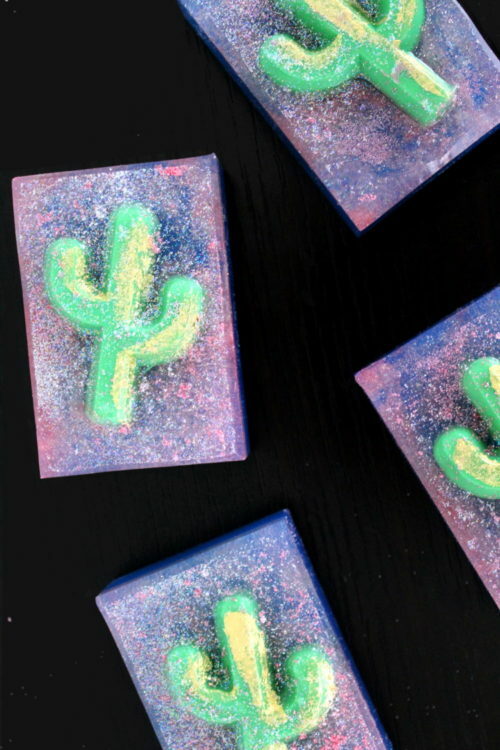 This glittery, colorful cactus soap recipe is easier to make than you might think! And it makes a great DIY back to school teacher gift! Crafted using a combination of detergent free melt and pour soap bases and eco-friendly, biodegradable glitter, my DIY cactus soap is not only fun to use, but it’s also safe for the environment and your skin. 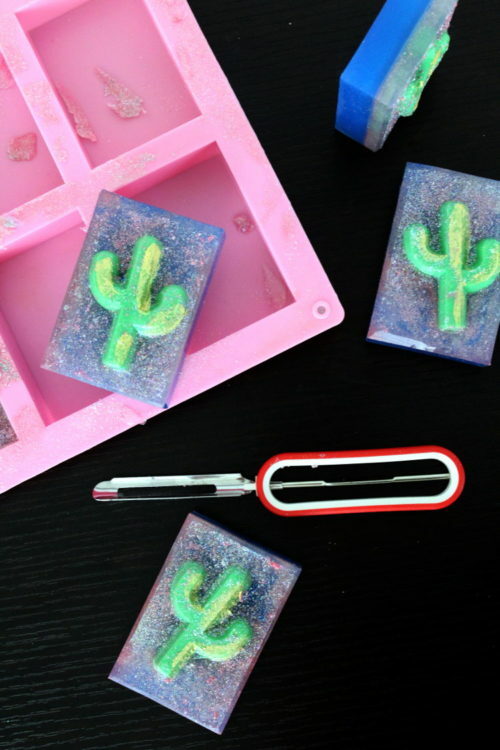 Keep reading to learn how to make your own sparkly cactus soaps! Eco-friendly, biodegradable cosmetic glitter hasn’t been around long but now that it’s readily available it allows you to make a positive impact on the environment. Eco-friendly glitter is biodegradable, sustainable, compostable and environmentally safe. While traditional glitter not only hangs around in the environment, but also pollutes our water and has a negative effect on marine wildlife. 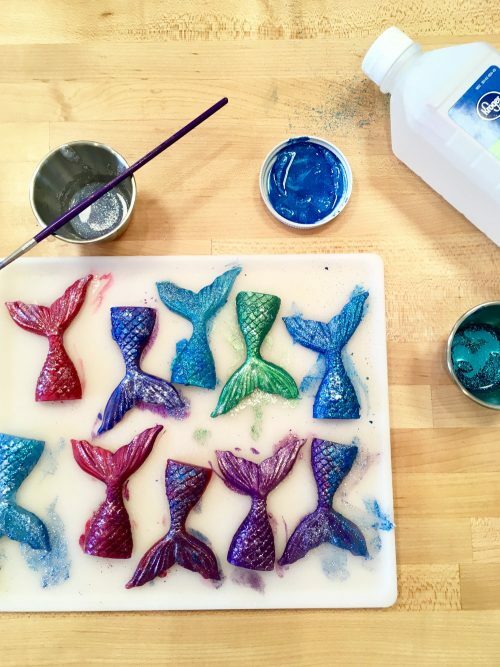 Made from the cellulose from eucalyptus trees, eco-friendly biodegradable glitter is body safe and therefore can be used in face painting, soapmaking, bath bombs and other skin care applications. You can learn more about biodegradable glitter at The Sparkle Party here. My DIY cactus soap requires two silicone soap molds. You will need this Blush cactus silicone mold and this six cavity rectangle silicone soap mold to make these soaps. You’ll also need 2 lbs. of a melt and pour soap base. I used three different Stephenson melt and pour soap bases for my DIY cactus soap. However, you can use the same base for each step if desired. You’ll just need to make sure it’s a clear melt and pour soap base so you can see the layers of eco-friendly glitter! You may also find a spray bottle filled with isopropyl alcohol (rubbing alcohol) helpful in removing any air bubbles that may arise. In addition, you will also need a digital scale to weigh all of the ingredients, a 4-cup glass Pyrex measuring cup, a potato peeler and a microwave or double boiler. 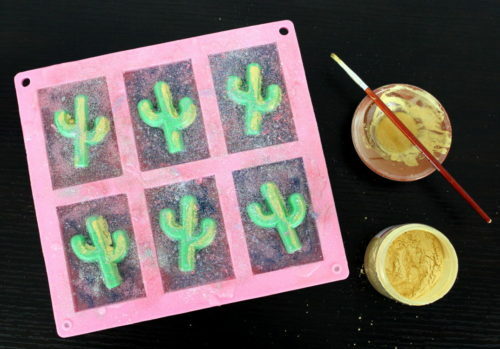 You’ll begin by making the cactus soap embeds for your DIY cactus soap. To do this, use a digital scale to weigh out 3 oz. of Stephenson Goat’s Milk Melt and Pour Soap Base. Cut the soap into chunks then combine in a 4-cup glass Pyrex measuring cup. Heat the soap at 50% power in the microwave until melted. 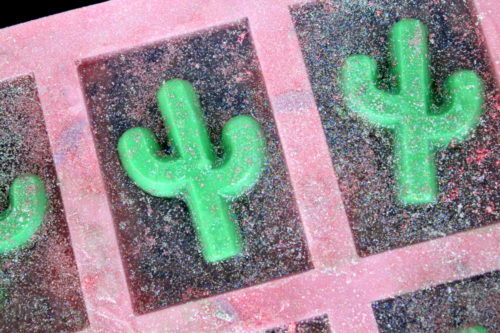 Tip: If you want more color pop to your cactus soap embed, use a clear melt and pour soap base for this step. 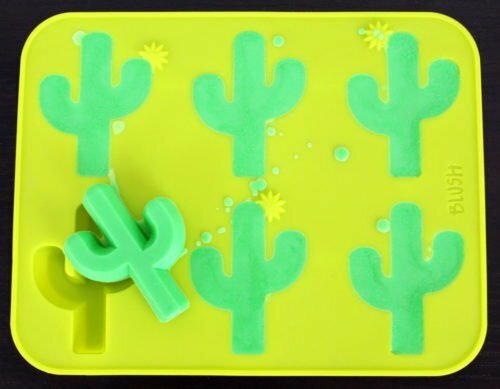 Pour the melted green soap into all six of the cavities of your cactus silicone soap mold. Set aside. While the cactus soap is cooling, you can make the bottom layer of blue soap in the rectangle soap mold. To do this, weigh out 16 oz. of Stephenson Aloe Melt and Pour Soap Base. Cut into cubes and combine in a 4-cup glass Pyrex measuring cup. Heat in the microwave at 50% power until melted. Remove the melted soap from the microwave and add your blue soap colorant to suit. (I specifically used an electric blue mica powder for this step.) Mix well until the color is evenly distributed throughout. Then weigh out and stir in .45 oz. of fragrance oil by weight. Evenly pour the blue soap into each of the six cavities of your rectangle silicone mold. Fill each cavity 3/4 of the way full. Then spritz the soap with alcohol to remove any air bubbles. Set the molded soap aside to re-harden. Once both the blue soap and the green cactus soaps have hardened, you’re ready for the next step. Spritz the tops of the blue rectangle soap bars in the rectangle silicone mold with alcohol. Then sprinkle a fine layer of eco-friendly, biodegradable glitter on top of the soap bars. I used a combination of fine and chunky glitters in several colors. 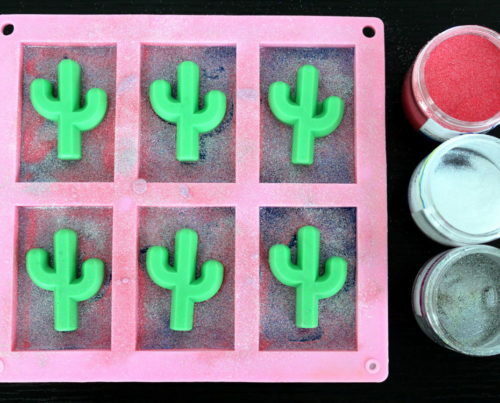 Remove the green cactus soap embeds from the cactus silicone mold. Spritz the tops of the blue soaps again and then place each of the cactus soaps on top of the blue soap bars. Set aside. Next, weigh out 6.65 oz. of Stephenson Clear Melt and Pour Soap Base. Cut into chunks and combine in a 4-cup glass Pyrex measuring cup. Add several pinches of glitter to suit, then weigh out and add .2 oz. of fragrance oil. Stir to combine. Spritz the tops of the soaps in the rectangle mold with alcohol. Now, with one finger pressing down on one of the cactus soaps, slowly pour the clear soap into the cavity of the mold that you are pressing down on the cactus soap of. Fill the cavity to the top of the mold with soap, then repeat the process with the remaining five cavities of your mold. Spritz the tops of all of the soap bars with rubbing alcohol to remove any air bubbles, then dust them with a fine layer of glitter. Set the soaps aside to harden. Once your soaps have rehardened, you’re ready to paint on the gold accents. To do this, combine a small amount of gold mica powder with rubbing alcohol so it’s somewhere between fluid and a paste. Then, using a small paintbrush, paint the mica onto the tops and edges of the cacti as desired. Let dry. 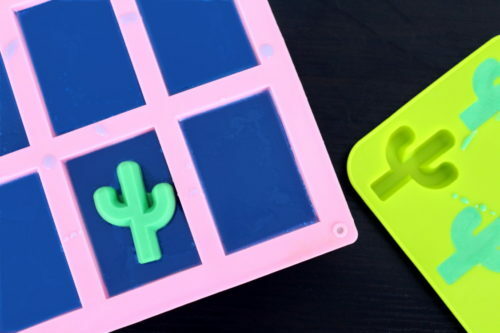 Now remove each of your DIY cactus soaps from the rectangle silicone mold. Use a potato peeler to bevel the top edges on all six of your soaps. All that’s left is to tightly wrap each of your cactus soaps in foodservice film to protect them from dirt and moisture. Your cactus soaps are now ready for personal use or gifting! If you enjoyed my melt and pour DIY cactus soap tutorial, then you may like some of my other melt and pour soap recipes. You can find my entire library of melt and pour soap recipes here. In addition you may also enjoy both my Simply Soapmaking Pinterest board and my DIY Bath & Body Pinterest board. Or simply follow all of my Pinterest boards here. Have you made my DIY cactus soaps or another bath and body related product? I’d love to see them! Be sure to share your own projects with me and my readers by tagging them with #soapdelishowoff on instagram.